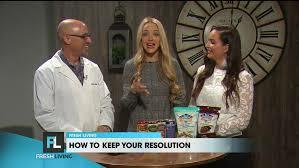 (KUTV) Salt Lake City – Don’t give up on your New Year’s Resolution just yet. Dr. Shawn Talbott, a nutritional biochemist who researches how to help people feel, look, and perform their best, appeared on Fresh Living to share the 5 R’s of Resolutions. January 17, 2018 was the annual “Ditch New Year’s Resolution Day” – where people are encouraged to just forget about any of their promises to get healthier – or lose weight – or improve, start doing, or stop doing anything in 2018. The rationale behind Resolution Quit Day is simple – lots of people who make New Year’s resolutions will break them or give up on them before the end of January (some estimates say 80%). One reason for the high quit rate is that people are lacking in either motivation or confidence. When we assess “Readiness to change” (the first R) – we want people to rate themselves at least a “6” (on a scale of 1-10) for both motivation (the change is important enough to you) and confidence (that you have the skills/knowledge to achieve it). If your score is lower than 6, then you probably need to scale back your aspirations (such as lose 10lbs instead of lose 50lbs). For example, maybe you want to stop eating ice cream while watching late night TV? You can’t just tell yourself to simply “stop doing that” – you need to Replace the old habits with a set of new habits (that’s the 5th R). In this scenario, you’re still using the same “reminder” and getting the same “reward” – all that has changed is the “routine” – which is really the core of the thing that you wanted to change. This is just a “simple” example of habit change – but the general rule applies to other more complex behavior changes. Break the habit down into it’s 3-part cycle (three Rs – Reminder, Routine, and Reward), make sure that you’re Ready to change the cycle, and then Replace the old behavior(s) with new behavior(s). On the Zoom with Pat tonight (Tuesday), guest host Mark Zuckerbrod and I will give an overview of Amare Global (The Mental Wellness Company) and then take YOUR questions. In the last two months, two major health/fitness publications have released feature stories about the close link between microbiome balance, gut-brain-axis function, and mood states such as depression, anxiety, and stress. Having worked in the area of “mental wellness” (stress, burnout, vigor) for most of my career (almost 20 years – yikes!) – it is extremely gratifying to see how these ideas are starting to hit the mainstream consciousness (out of the lab and into the public where people can actually benefit from them). Lots of very exciting things to come – including targeted natural therapies to help people restore microbiome balance and optimize their entire gut-brain-axis to improve mental wellness and physical health. (KUTV) Salt Lake City – Are you feeding your microbiome right? Dr. Shawn Talbott, a nutritional biochemist, joined Brooke and Caitlin on Fresh Living to explain what a microbiome is and how to take care of it. “Today, we’ll be talking about how we can improve both our mental wellness and our physical health by properly nourishing the bacteria in our guts – the microbiome. The microbiome is the collection of 100 trillion bacteria that live in our digestive system. They’re important for our health because they help us digest food, but they also produce a wide range of nutrients and other chemicals that help keep us healthy. For example, the microbiome controls how our immune system works, it regulates how much inflammation we have in our body, and it produces neurotransmitters such as serotonin and dopamine that help determine our mood. So, how do you keep those beneficial bacteria healthy? You feed them the right types of foods – and that means lots of fiber, protein and phytonutrients. Unfortunately, these nutrients can often be bitter and not exactly delicious – so I have my two assistants here today – my daughter Courtney Talbott and her friend Jaclyn Optiz. They’re both nutrition students at CalPoly and they created these recipes (see below for recipes). Add all ingredients to a blender and blend until smooth! Add ice cubes or freeze some ingredients for a thicker smoothie. Feel free to add all the ingredients except almond butter, milk, and oats to a freezer safe ziploc bag to make a ready to blend smoothie pack. Preheat oven to 350 degrees (F) and grease or line a muffin tin. Finely shred carrots and chop walnuts. In a large bowl, beat together applesauce, vegetable oil, and sugars until combined. Add in egg and vanilla, followed by carrots. Add the remaining dry ingredients, scraping the bowl as needed until no streaks remain. Divide the mixture evenly between the tin. Cool in the pan for 5 minutes before moving to a wire rack to cool completely.